This process is growing in popularity. 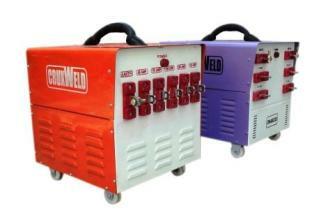 It is being used for more than 20% of arc welding machine. Some FCAW still uses CO2 shielding, but the use of flux cored wire alone is increasing. 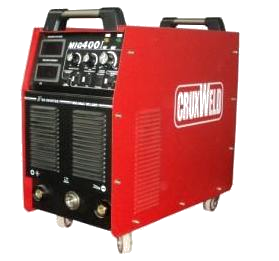 In many cases, the flux-cored wire alone produces welds equal to or better than the original metal and its uses eliminates the need for the gas shield equipment and cost of the gas. The FCAW is a process in which coalescence is produced by heating with an electric arc between a continuous tubular consumable electrode and the work. The electrode is flux cored, i.e. the flux is contained within the electrode which is hollow. In addition to flux, mineral and ferro alloys in the core can provide additional protection and composition control. The flux cored electrode is coiled and supplied to the arc as a continuous wire as in CO2 welding. The flux inside the wire provides the necessary shielding of the weld pool. Additional shielding may (or may not) be obtained from an externally supplied gas (e.g. CO2) or gas mixture. As explained above, FCAW utilizes the heat of an arc between continuously fed consumable flux cored electrode and the work. The heat of the arc melts the surface of the base metal and the end of the electrode. The metal melted off the electrode is transferred through the arc to the workpiece where it becomes the deposited weld metal. Shielding is obtained from the disintegration of ingredients contained within the flux cored electrode. Additional shielding may be obtained from an envelope of gas supplied through a nozzle to the arc area. Ingredients within the electrode produce gas for shielding and also provide deoxidizers, ionizers, purifying agents and in some cases alloying elements (for composition control). These ingredients from a glasslike slag, which is lighter in weight than the deposited weld metal and which floats on the surface of the weld as a protective cover. The flux cored electrode is fed into the arc automatically from a coil. The arc is maintained automatically and arc travel can be manual or by machine. 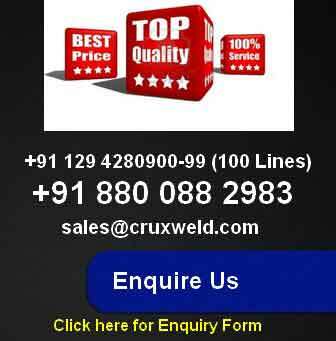 The flux cored arc welding machine (FCAW Welding Machine) process introduced in early 1950 is a modification if MIG welding Machine process, in which solid wire is replaced by a flux cored electrode wire, i.e. a tubular wire filled inside with flux and alloy additions.